So I read another Beauty and the Beast retelling. As one does. Cruel Beauty has been on my radar for several months now. The truth is I was a goner when I heard it blended my favorite fairy tale with Greek mythology. Having read it now, another truth is that, in my humble opinion, it would be better billed as a Cupid & Psyche retelling. Not that all the lovely elements of Beauty and the Beast aren't there and thriving. As a matter of fact, threads of several different fairy tales run through the veins of this crazy, lovely book. And I appreciated all of them. But the Greek mythology aspect of it is real and very important to the story as a whole. As such, I think it bears the strongest resemblance to the tale of beleaguered Psyche and the god she weds. 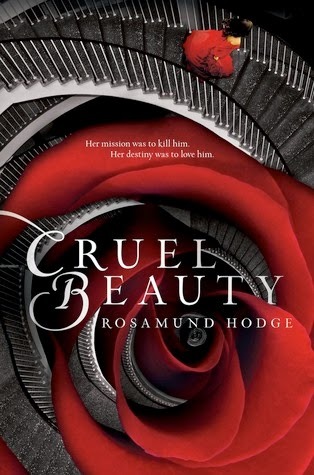 I've read a myriad different reactions to Rosamund Hodge's debut novel, and I can credit all of them because Cruel Beauty is a twisty, mercurial cracker of a tale and most readers are not going to feel mildly about it one way or the other. I do hope you'll give it a shot and see which way your feelings lean. Nyx is a sharply honed blade. Raised from a child knowing precisely what was expected of her, she has never known the simple happiness of her sister Astraia, the noble firmness her father, or the proper domesticity of her aunt Telomache. All she has known is dread and hate and unscaleable walls. So when the day finally comes when she is to fulfill her duty and marry the Gentle Lord as befit the terms of her father's bargain with the demon, there is very little she will miss about her home or the family members who claim to love her yet are willing to send her off to a fate worse than death if it means it will save their own skins. In fact, despite the primitive terror she feels when the heavy castle door shuts behind her, she is ready. She is done with waiting and ready to avenge her mother's death and defeat the evil lord who brought an ancient curse on the land of Arcadia. Either that or she will die trying. It's doesn't make much difference to Nyx. Until she makes her new husband's acquaintance, that is. Until she looks into his blood red cat's eyes and listens to his mocking voice as it tells of past wives, all of them useless, all of them dead. How very glad he is she's arrived to provide the next course of entertainment. Then? Why then she wants to kill him very, very much indeed. I love immeasurably flawed protagonists. I love them, love them, love them. So I experienced something akin to glee when I realized Nyx and Ignifex were the real thing. She wants to kill him. When she says she hates everyone in her life, she is not kidding. And that hate flows off the page. In a good way. He finds her endlessly amusing and he fully expects her to join his eight past wives in the family tomb, as it were. When he says the people who come to him to bargain get what they deserve, he really believes it. Their verbal (and physical) sparring gets underway the very first night Nyx arrives at his home, and it just doesn't let up. Basically, I wore a deranged grin every time they exchange parries. And every night as Nyx set off to explore the castle and find the path to destroying her husband, I relished the beautiful and terrifying descriptions of the ballroom that is also a midnight lake, the library full of books she cannot read, the mirror that bears a keyhole, and the shadows that lick at her heels. It is worth pointing out that while I enjoyed myself throughout the book, it wasn't until roundabout the halfway mark that things reached unputdownable status. But reach it they did, and I read the last half through in one headlong rush. There is one other denizen of the Gentle Lord's home. One who remains there against his will and who sets out to help Nyx on her bloody quest. His name is Shade. He is quite literally Ignifex's shadow, and he believes that this time, this wife might actually be his hope of escape. I never knew quite what to think of Shade. My feelings for Ignifex were immediate and sure, but Shade left me alternately hot and cold. His role in the tale is a murky one, and I will admit to resenting his presence at times, even up through the end. But much of that can be chalked up to the sheer sparkle and force imbued in every scene in which Nyx and Ignifex share the page. I quite simply couldn't look away from the girl intent on murder and the quicksilver demon who has been the agent of murder for centuries. Because something remarkable and elusive was happening to them both, even as they threatened each other with all manner of bodily harm and eternal torment. And the fact that Ms. Hodge managed to quietly craft this fragile something inside a fortress of fury, without compromising her characters, well, it impressed me. I love them so very much for all their vengeful hearts and angry, clenching hands. But perhaps most of all for the ultimate mercy they show (not to themselves, but to one another) in spite of the suffering they've undergone. "You don't think our plan will work." "I'd give it rather low odds." I leaned forward, hoping that for once his gloating temperament would be useful. "Why not? Explain to me how I'm stupid, husband." He poked my nose. "You're not stupid and neither is your plan. But the Heart of Air is utterly beyond your reach. And your people have not even begun to grasp the nature of this house." "Then tell me." I tilted my head. "Or are you scared?" "No," he said placidly, and abruptly dropped to the ground, resting his head in my lap. "Tired." I swallowed. The easy comfort of the gesture touched me in a way his kisses had not. I couldn't understand why he kept acting like he trusted me. "I had a long night," he added, looking up at me from under his lashes. "I told you I'm not sorry," I growled. "Of course not." He smiled with his eyes shut. "You deserve all that and more. It made me happy to see you suffer. I would do it all over again if I could." I realized I was shaking as the words tumbled out of me. "I would do it again and again. Every night I would torment you and laugh. Do you understand? You are never safe with me." I drew a shuddering breath, trying to will away the sting of tears. He opened his eyes and stared up at me as if I were the door out of Arcadia and back to the true sky. "That's what makes you my favorite." He reached up and wiped a tear off my cheek with his thumb. "Every wicked bit of you." All Things Urban Fantasy - "CRUEL BEAUTY is the fairy tale retelling I didn’t know I was waiting for." Cuddlebuggery - "Cruel Beauty is spectacular." Dark Faerie Tales - "The writing style is very descriptive and lyrical, but there were times I had to reread parts to understand what was going on." Ivy Book Bindings - "Cruel Beauty veered far from the track of my expectations - in the best possible way." Sab the Book Eater - "There's so many layers to the story that I was guessing up to the very end." Wrapped Up in Books - "Those who like their fantasy a bit dark and don’t mind a lack of humor to balance it out will appreciate the tone and mood of the story." This is one of the books I was wondering if I should buy and read for the beginning of the year. It sounds like I should take the plunge! Great review! Take it! I was pleasantly surprised at how much I enjoyed it. Agreed 100%. I loved this one! Did you?! Well, that just makes me smile. I agree this was not very Beauty and the Beast -esque. But I kind of hated it! Oh, I'm sorry! It does seem to really rub some readers wrong and go down smoothly for others. What bothered you the most? Oh, this review is lovely and perfect. I loved Cruel Beauty too and especially that Nyx was not perfect and she did have hate and I am okay with that. AND ALSO IGNIFEX for always. So, really, you had me at Beauty and the Beast, but you had me irrevocably at Cupid and Psyche. YES. It is good and you must read it. I'm so excited to read this! Thanks for the wonderful review! My pleasure, Rebecca. Hope you enjoy it as much as I did! I had to read CRUEL BEAUTY after seeing all of these *reactions* to the story (including yours, naturally). I fell in love with the mythology and the writing, but not the romance so much. I did have one or two of those grinning big moments you mention, but I didn't feel that way overall. That said, I ended up liking the book very much. It takes all kinds, doesn't it? Absolutely. And like I said, I have no trouble at all envisioning your response. It's just so all over the place and not what you're expecting. The mythology was so great, wasn't it? I'm really looking forward to whatever she tackles next. I am not into fairy retellings, but this one - the wickedness of the story is just too fresh and animating. I really enjoyed the swoon on this one! I would really like to know if Hodge read/loved Rose Daughter. There was just a certain intangible something in her novel that reminded me of McKinley's. Also, IGNIFEX. Have you read Of Best and Beauty by Stacey Jay? SO GOOD. Also twisty and unexpected like Cruel Beauty. There was TOTALLY a Rose Daughter feel to it. I started it just briefly awhile back and was distracted by something shiny. Must get back to it soon!